You can read or listen to our modules. There is a play button in each heading so you can listen while you read. Or you can listen to the whole module in one go or download it as a podcast. You'll find a play and download button for the whole module at the bottom of this page. At the end of the module there is a quiz, so you can test your knowledge and receive a CPD certificate. You will have to hit the play button on the quiz video and enter your name and email address before you start the quiz. When travelling from Great Britain or Ireland to mainland Europe, pets may be exposed to a wide range of exotic parasites. This module focuses on control strategies for four parasites that are of particular concern because they can cause serious disease in people or pets. People bringing pets into the UK need to comply with the government’s Pet Travel Scheme, which requires that dogs are protected against rabies, and are wormed to prevent the introduction of the tapeworm Echinococcus multilocularis, which is a danger to human health. Pet owners should also think about protecting their pets against other parasite threats. The main ones to be concerned about are the heartworm Dirofilaria immitis; ticks and tick-borne diseases; and the microorganism Leishmania infantum. The tapeworm E. multilocularis can cause serious disease in humans. The adult tapeworm is carried by dogs, foxes and some types of voles. Dogs and foxes become infected through predation of voles. Cats can also become infected with E. multilocularis but they are not an important source of the infection. The tapeworm does not usually cause disease in pets but eggs passed in the faeces of dogs and foxes are immediately infective. People can become infected after ingestion of the eggs, through association with infected dogs, via public spaces contaminated with dog faeces, or by eating contaminated raw fruit and vegetables. Infection results in the spread of cysts leading to disease in the liver or in several organs in the body. Over the last two decades, the tapeworm has spread from its focus in eastern France, southern Germany and parts of Switzerland and Austria, to Baltic regions, Denmark, the Netherlands, Poland, Romania, Slovakia and Slovenia. Look at the map to see where E. multilocularis is present in Europe. Only Great Britain and Ireland, Malta, Finland and Norway are free of the worm. Fig 1. Range of Echinococcus multilocularis in foxes in Europe, 2014 (courtesy of ESCCAP). It is highly important to prevent introduction of this tapeworm into the UK by treating dogs entering the UK with the wormer praziquantel. The Pet Travel Scheme requires that all dogs entering the UK are treated with praziquantel between 1 and 5 days before entry, unless returning from Finland, Ireland, Malta or Norway. Dogs must be treated by a vet using a product licensed in the country in which the dog is treated. The vet must make a record of the treatment in the pet passport or certificate. Click this link to read the requirements of the Pet Travel Scheme. Praziquantel only remains in the body for 4–6 hours after treatment. This means there is a theoretical risk of infection during the 1–5 days before return to the UK. Therefore parasitologists recommend that dogs should be treated again within 30 days of return to the UK to ensure any infection that has occurred in the short gap is eliminated. Dogs on long stays abroad should be treated with praziquantel every 30 days while abroad. This is because dogs infected while abroad will shed tapeworm eggs in their faeces after 30 days, so presenting a risk of infection to their owners. For short trips, the Pet Travel Scheme requires the dog to be treated by a vet before leaving the UK and not to return for at least 24 hours. There are many non-prescription wormers containing praziquantel. Some prescription-only products also contain a wormer that will protect against heartworm. Dirofilaria immitis is a small thread-like worm. Adult worms live in the heart and sometimes in the arteries of the lung. It mainly infects dogs but it can also infect cats and ferrets. It causes heart disease in dogs, cats and ferrets, and bronchitis in cats. Transmission occurs through the bites of infected mosquitoes. This parasite is present throughout southern Europe and has spread into eastern European countries such as Romania and Bulgaria. Look at the map to see the range of Dirofilaria immitis in Europe. Fig 2. 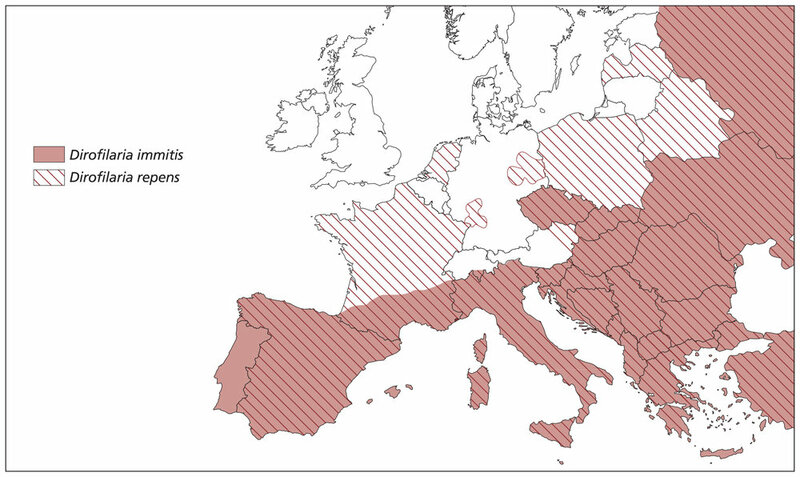 Approximate distribution of Dirofilaria immitis and Dirofilaria repens in Europe as of 2015 (courtesy of ESCCAP). The worm is not present in the UK. The mosquito that transmits the worm is endemic in most European countries, including the UK, but the colder climate in northern Europe has prevented heartworm from becoming endemic because the adult mosquito does not live long enough for heartworm to complete its lifecycle. However, climate change is enabling the spread of the parasite northwards, raising the possibility that the worm could establish in southern England. This disease can be prevented by using specific wormers and avoidance of mosquitoes. Products for the control of heartworm contain a macrocyclic lactone and are only available on prescription (POM-V). Treatment should be started before travel and continued monthly until return to the UK. Mosquito repellents are a useful second line of defence, but should not be solely relied upon. Deltamethrin (Scalibor) collar is a non-prescription product licensed to repel mosquitoes. Other mosquito-repelling products are available on prescription. Pets travelling abroad may come into contact with a variety of diseases carried by ticks. Several are of concern because they can cause serious disease in dogs or humans. Dermacentor reticulatus ticks transmit the parasitic microorganism Babesia canis, which can cause life-threatening anaemia in dogs. This tick has established in small areas of the UK and so it is possible that Babesia could also become established here if introduced by dogs arriving from abroad. There is evidence that this may already be starting. Riphicephalus sanguineus ticks are capable of carrying a wide range of diseases that affect dogs, including the bacteria Ehrilchia canis, which can cause severe blood disorders. The tick’s range has been restricted to warmer climates in southern Europe but there have been reports in the UK of an increased number of Ehrlichia canis cases transmitted by R. sanguineus in travelled dogs. It is unlikely that the tick would establish outdoor endemic populations in the UK, but it can complete its lifecycle in 3 months, which is sufficiently fast to allow it to infest centrally-heated UK homes. This is a concern, because these ticks may carry pathogens that can cause disease in humans, such as Rickettsia conorii (the cause of Mediterranean spotted fever). Ixodes ricinus ticks, which are endemic in the UK, can transmit tick-borne encephalitis, a viral disease that may infect a variety of mammals including dogs and humans. Although human infection is uncommon, it can be fatal and so concern about its spread through Europe has been high. In Europe, the virus is a parasite predominantly of Eastern countries but its distribution has been moving north and west, with cases emerging in Scandinavia. Infected ticks or pets entering the UK could potentially lead to establishment of the viral infection in native ticks. Parasite specialists recommend use of an effective tick-control product in pets travelling abroad to help prevent new tick-borne diseases entering the UK. Suitable products are those that have been shown to kill ticks rapidly (with 24 hours) or products that repel and kill ticks. Products that have been shown to kill ticks within 24 hours of tick attachment contain one of the isooxazoline drugs (i.e. afoxolaner, fluralaner or sarolaner). These are only available on prescription (POM-V). Spot-ons or collars containing a pyrethroid have tick-repellent and killing effects. Deltamethrin, flumethrin and permethrin are pyrethroids. As it is thought that the bacteria Ehrlichia canis can be transmitted within only a few hours of a tick bite, this type of tick-repellent may be more suitable than tick-killing products for pets travelling in countries where the tick R. sanguineus is endemic. Treatment with this type of product should be started 1 week before travel because the drug will take time to distribute over the body. No tick product is 100% effective and so pet owners should check their animal for ticks regularly and remove any found. Leishmaniosis is a disease in dogs, cats and humans caused by the microorganism Leishmania infantum. Transmission of this parasite mainly occurs through bites from infected sandflies, which are usually found in the south of France and southern Europe. However, large numbers of cases of leishmaniosis are being seen in the UK in imported and travelled pets. Disease prevention relies on preventing sandfly bites. Parasitologists consider disease prevention essential for dogs travelling to endemic countries. This involves using a product containing a pyrethroid (i.e. deltamethrin, flumethrin or permethrin) to prevent sandflies from biting. The treatment should be started 1 week before travel because pyrethroids, which are all used as spot-ons or collars, take time to distribute over the body. No fly repellent is 100% effective and so pet owners should contact their vet to discuss other preventive measures for dogs and cats travelling frequently or for long periods in endemic countries. Deltamethrin (Scalibor) collar is the only non-prescription product licensed to repel sandflies. Other sandfly-repelling products are available on prescription (POM-V). Maps showing European parasite distributions by country are on the websites of the European Scientific Council Companion Animal Parasites, an independent organisation of parasitology specialists. Follow the links ESCCAP and ESCCAP UK & Ireland to see the information on these sites. Pet owners should consult their veterinary practice, which may be able to help them identify the main parasite threats in the destination of travel and for advice on preventive measures. Veterinary practices in the destination country will have local knowledge of endemic parasite foci and seasonal transmission, as well as peak activity times of local mosquitoes and tick vectors. There are some practical things that pet owners can do, in addition to using preventive medicines, to help reduce exposure to parasitic diseases or development of disease while abroad. Prevent predatory and scavenging behaviour: Dogs and cats become infected with E. multilocularis through consumption of prey animals, so preventing this will halt transmission. Given the severity of the disease, this should never be relied upon alone. Check for ticks at least every 24 hours. Even if preventive treatment is used it is important that pet owners check pets for ticks daily, removing any with a tick removal device or fine-pointed tweezers. Avoid insect bites. Sandflies feed at night and are most active at dawn and dusk, so avoiding outdoor activity at these times helps to prevent exposure. They are also poor flyers, so sleeping with pets upstairs at night, if possible, is sensible. If camping outdoors, breezy high locations are better. Fine-mesh insecticide-impregnated nets on dogs’ beds may help limit exposure at night; these are unsuitable for cats. Pet owners taking their pets abroad need to think about protecting their pets against parasites they might encounter. Parasite protection is also important in helping to prevent new parasites and their vectors becoming established in the UK. All dogs, cats and ferrets returning to the UK from a trip abroad (apart from a few specific countries) need to be treated with praziquantel to protect against the tapeworm Echinococcus multilocularis. Depending on the countries visited, pets might also need protection against ticks and heartworm, and sandfly- and mosquito-bites. Pet owners should consult their vet for advice about preventive therapies. Some are only available on prescription. As well as using preventive medicines, pet owners can also do practical things (like checking for ticks) to help prevent infection. You can listen to a complete podcast of the module by using the play button below or use the download link on the right-hand side of the player to download the podcast to your mobile device. Brianti E et al. Field evaluation of two different treatment approaches and their ability to control fleas and prevent canine leishmaniosis in a highly endemic area. PLOS Neglected Tropical Diseases 2016: doi :10.1371/journal.pntd.0004987. de Marco M et al. Emergence of Babesia canis in southern England. Parasit Vectors 2017; 10: 241. ESCCAP UK & Ireland. Echinococcus multilocularis treatment on return to the UK [website]. [Accessed 14.2.18]. ESCCAP. Worm control in dogs and cats. ESCCAP Guideline 01 Third Edition – July 2017. Fourie JJ et al. Transmission of Ehrlichia canis by Rhipicephalus sanguineus ticks feeding on dogs and on artificial membranes. Vet Parasitol 2013; 197: 595-603. Hansford KM et al. Potential risk posed by the importation of ticks into the UK on animals: records from the Tick Surveillance Scheme. Vet Rec 2017: doi: 10.1136/vr.104263. Little SE. Changing paradigms in understanding transmission of canine tick-borne diseases: the role of interrupted feeding and intrastadial transmission. Proceedings of the 2nd Canine Vector-Borne Disease (CVBD) Symposium; 2007 April 25-28; Mazara del Vallo, Sicily, Italy. Germany: Bayer HealthCare; 2007. P. 30–4. Oksanen A et al. The geographical distribution and prevalence of Echinococcus multilocularis in animals in the European Union and adjacent countries: a systematic review and meta-analysis. Parasit Vectors 2016; 9: 519. Pettersson JH-O et al. Prevalence of tick-borne encephalitis virus in Ixodes ricinus ticks in northern Europe with particular reference to Southern Sweden. Parasit Vectors 2014; 7: 102. Phipps L et al. Babesia canis detected in dogs and associated ticks from Essex. Vet Rec 2016; 178: 243-4. Woodmansey D. ‘New tick-borne disease confirmed in UK dogs’. Veterinary Times 2016; 46: 1.